Compared to the uncompromising onslaught of Fucked On A Pile of Corpses, Skullflower's contribution to this split vinyl LP with Mastery, is much more riff-heavy but it's by no means a rock record. The overall effect is seemingly more contemplative and meditative with an emphasis on a dark doom sound as opposed to the black psychedelia that's normally found at the heart of their current sound, though elements of both can be found within their three tracks. Mastery, a one-man project, from the San Francisco Bay-area, fill their side with a turbulent slice of black metal. Skullflower have never sounded as controlled as they do on the opener 'Wolf Age' - which shouldn't be confused with 'White Wolf', Skullflower's contribution to Cold Spring's limited series of one sided vinyl 12-inches. Here the blackened doom chords are more symphonic, slowly unfolding to create a tense and powerful atmosphere. You can almost sense a storm brewing as the mammoth buzzing riffs from Matthew Bower's guitar summon dark clouds, while waves of feedback ooze over distant cymbal crashes. 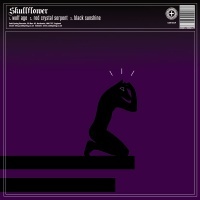 'Wolf Age' catches Skullflower at their most majestic and euphoric. Skullfower don't send the guitars into the red or rely on noise for these three tracks but they do heighten the distortion on 'Red Crystal Serpent' as a lone guitar lets loose with a dizzying series of chugging riffs, while underneath feedback squeals and a barrage of drum rolls add a hazy battleworn texture to the explosive din. On their final piece, 'Black Sunshine', wiry guitar mannerisms skulk around a wall of sustained moaning guitars, which somehow generates a mass of ecstatic cries, amidst distant percussion hammers. God knows how, but on 'Black Sunshine' they sound like a primitive rock group backed by a hellish choir performing in the dank caverns of the underworld. The sound of Skullflower on these three tracks is of a slow burning primal fury, far removed from the noise assaults of their previous release on Cold Spring. Mastery quickly dispense with pummeling beats and frequencies as 'Blood Electric' lurches into frenetic sped up riffing with its corrosive vocalisations, manic guitar parts and ultra-fast riffage, that twists and turns before your ears. There are passages of quietness with the occasional strum and picked acoustic guitar notes, but you know they're just biding their time, before the next onslaught. And it comes furiously, as words are spat out and blackened guitars are shredded in an almost hyper sped improvised fashion. I certainly wasn't expecting this.